USS Forrestal, named for Secretary of the Navy James Forrestal, was the first ship of the new 56,000-ton aircraft carriers built during the 1950’s. After being built in Newport News, Virginia, the new ship was formally commissioned in October 1955. After her initial shakedown, she was took her first of many voyages to the Mediterranean in January of 1957. For the next 8 years, she made several more voyages to the Mediterranean, with other cruises in the Atlantic and Caribbean. In June 1967, she went to the Pacific to aid with the Vietnam War effort. This cruise was cut short by a devastating fire on 29 July of that year. Despite the heroic efforts of the crew, 130 men lost their lives. The repairs took several months. But by the middle of 1968, Forrestal was making her eighth Mediterranean voyage. That sea would be a common destination for her over the next twenty or so years. In 1975, she was reclassified CV-59. In the mid-1980’s, the ship underwent a massive modernization program. During her lifetime, she participated in flood relief efforts, in confronting Libya, protecting Iraq’s Kurdish population, and she stood standby during the Kuwait war. After her deployment to Kuwait, the ship was re-designated as a training ship carrying a new hull number, ATV-59. The ship was hit by the Navy budget cuts and decommissioned in September 1993. JUN 1967 - SEP 1967 USS FORRESTAL/FIRE AND EXPLOSIONS ON FLIGHT DECK/29-7-67. Forrestal (CVA-59) was launched 11 December 1954 by Newport News Shipbuilding and Drydock Co. Newport News Va.; sponsored by Mrs. James V Forrestal widow of Secretary Forrestal; and commissioned 1 October 1955 Captain R. L. Johnson i n command. From her home port Norfolk Va. Forrestal spent the first year of her commissioned service in intensive training operations off the Virginia Capes and in the Caribbean. An important assignment was training aviators in the use of her advance d facilities a duty on which she often operated out of Mayport Fla. On 7 November 1956 she put to sea from Mayport to operate in the eastern Atlantic during the Suez Crisis ready to enter the Mediterranean should her great strength be necessary. She returned to Norfolk 12 December to prepare for her first deployment with the 6th Fleet in the Mediterranean for which she sailed 15 January 1957. On this as on her succeeding tours of duty in the Mediterranean Forrestal visited many ports to allow dignitaries and the general public to come aboard and view the tremendous power for peace she represented. For military observers she sta ged underway demonstrations to illustrate her capacity to bring air power to and from the sea in military operations on any scale. She returned to Norfolk 22 July 1957 for exercises off the North Carolina coast in preparation for her first NATO Opera tion "Strikeback " in the North Sea. This deployment between 3 September and 22 October found her visiting Southampton England as well as drilling in the highly important task of coordinating United States naval power with that of other NATO nat ions. The next year found Forrestal participating in a series of major fleet exercises as well as taking part in experimental flight operations. During the Lebanon Crisis of summer 1958 the great carrier was again called upon to operate in the ea stern Atlantic to back up naval operations in the Mediterranean. 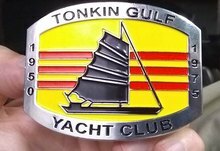 She sailed from Norfolk 11 July to embark an air group at Mayport 2 days later then patrolled the Atlantic until returning to Norfolk 17 July. On her second tour of duty in the Mediterranean from 2 September 1958 to 12 March 1959 Forrestal again combined a program of training patrol and participation in major exercises with ceremonial hospitality and public visiting. Her guest list during this cruise was headed by Secretary of Defense N. H. McElroy. Returning to Norfolk she continued the never ending task of training new aviators constantly maintaining her readiness for instant reaction to any demand for her services bro ught on by international events. Visitors during the year included King Hussein of Jordan. 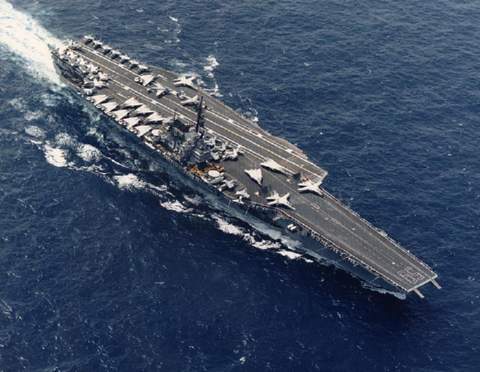 Forrestal again brought her imposing presence to the 6th Fleet between 28 January 1960 and 31 August visiting the ports usual to a Mediterranean deployment as well as Split Yugoslavia. Again she was open for visitors at many ports as well as taking part in the patrol and training schedule of the 6th Fleet. Upon her return to the United States she resumed her schedule of east coast and Caribbean operations for the remainder of the year.